LITTLE COLORADO RIVER GORGE, Ariz. Daredevil Nik Wallenda is using the Navajo Nation as a backdrop to one of his most ambitious feats yet  crossing a tightrope 1,500 feet above the Little Colorado River Gorge near the Grand Canyon. The 34-year-old Sarasota, Fla., resident will set out Sunday on a quarter-mile cable stretched over the gorge that was eyed by another high-wire performer decades ago. The stunt comes a year after he traversed Niagara Falls earning a seventh Guinness world record. He'll be using the same 2-inch-thick cable he used to cross the falls, only this time he won't be wearing a safety harness. After saying a prayer, "I give my wife and kids a hug and a kiss and tell them I'll see them in a bit," he told reporters Friday in Flagstaff. Wallenda is a seventh-generation high-wire artist and is part of the famous "Flying Wallendas" circus family  a clan that is no stranger to death-defying feats and great tragedy. 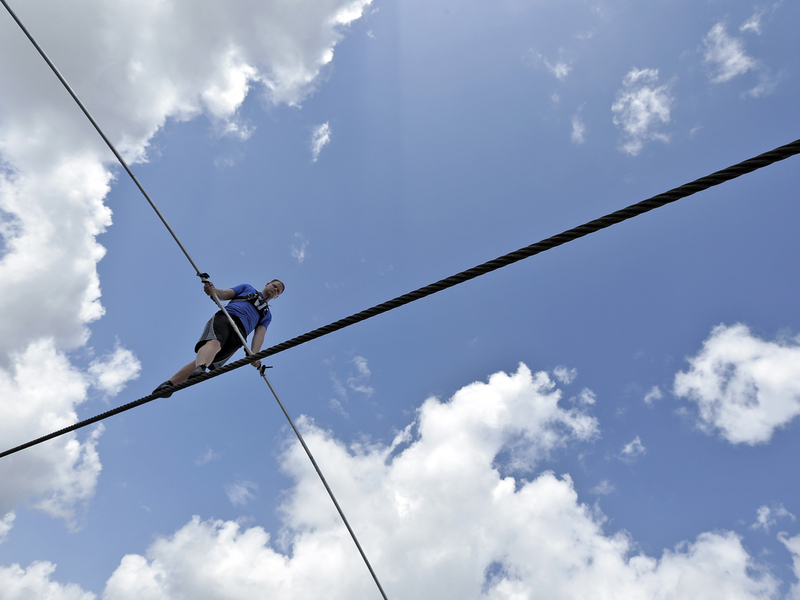 The Discovery Channel will broadcast Wallenda's walk live on live television at 8 p.m. EDT on Sunday with a 10-second delay. Wallenda will be wearing two cameras, one looking down the mostly dry Little Colorado River bed and one facing straight ahead. His leather shoes with an elk-skin sole will help him keep a grip on the steel cable as he moves across. Should wind gusts that are expected to be around 30 mph threaten to throw him off, Wallenda said he'll grab hold of the wire and wait it out if possible. A paramedic will be looking up at him from the river, he said. Wallenda is highly confident in his ability to reach the other side, having walked in 52 mph wind gusts during Tropical Storm Andrea with a torrential downpour and training with wind machines that simulated 45-55 mph gusts. The only thing that would stop him entirely is lightning within a 15-mile radius, he said. The more than 2-hour broadcast also will showcase the Navajo landscape that includes Monument Valley, Four Corners, Canyon de Chelly and the tribal capital of Window Rock. "When people watch this, our main thing is we want the world to know who Navajo people are, our culture, traditions and language are still very much alive," said Geri Hongeva, spokeswoman for the tribe's Division of Natural Resources. The stunt is touted as a walk across the Grand Canyon, an area held sacred by many American Indian tribes, and the fulfillment of a dream. Some local residents believe Wallenda hasn't accurately pinpointed the location and also say that the Navajo Nation shouldn't be promoting the gambling of one man's life for the benefit of tourism. "Mr. Wallenda needs to buy a GPS or somebody give this guy a map," said Milton Tso, president of the Cameron community on the Navajo Nation. "He's not walking across the Grand Canyon. He's walking across the Little Colorado River Gorge on the Navajo Nation. It's misleading and false advertising."